...that there is such thing as playing Pearl Jam too loud while in my car by myself. ...that the lead singer of Hanson was a guy. That made for awkward teenage feelings. ...Trader Joe's Somewhat Spicy Dill Flavored Kettle Cooked Potato Chips? Hardly, no matter what that crazy pseudo-lepruachaun ginger-mopped lookin' doofus says on the package. I can only say that because I'm sure similar pictures exist of me growing up. See "awkward teenager" comment above. But I sure as heck discovered one heckuva interesting chip. 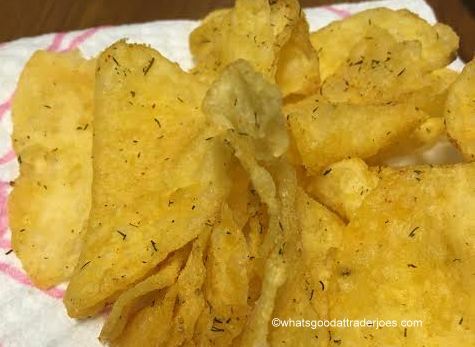 To get it out of the way, kettle chips are my go-to chip choice. I may have an occasional fling with lattice cut, and don't get me started on baked varieties (stale Styrofoam, anyone? ), but kettle cooked? With the super-extra-crunchilicious hearty bite? Yes, no doubt, and as would be expected, these are spot on. As for flavor, though? Hmm. They're tough to quantify. The chips taste more than "somewhat" spicy, but it could be all the pickle flavor amplifying the spices (not exactly stated on the ingredients, but presuming cayenne and garlic). There's an odd mingling interplay between the spice and the picklish bite, that's tough to draw a line between. So here's a new word. Spicy + pickley = spickley. That's not to say it's a completely seemless taste - there is some differentation - but where exactly is a good question. I can't make quite make it out after repeat tastings. In some ways, the chips taste like barbeque chips crossed with salt and vinegar ones with dill weed on the outside for a distinctive pickle flair. That "awkward teenager" that still exists inside of me wanted to crack up at that last sentence. But it's there. There's some heat, with a pickle twist, for a taste that lingers on for quite a bit afterwards. It'll make your breath reek, for sure. Both Sandy and I tend to enjoy them, although I'm still confounded by them. it doesn't help that Sandy thinks the chips could be a lot more picklicious. "they're more spicy than anything," she said. I don't entirely agree, but don't know how to counter in a productive manner either. Eh, here's to somethfing we can enjoy together enough. Neither one of us recall the price offhand but they're in the typical price range of $2 or $3 a bag. She likes them a little more than I, and she gave a four, so I'll go a small step behind. You can play pearl jam too loud?